Almost everyone has a dream to become a Master of something. Whether one's craft is biogenetics, basket-making or a given sport, there is something that kindles a fire in the soul to achieve crown and glory. To have one's name etched in the annals of history as one who has mastered a worthwhile activity is deemed laudatory. Chess masterdom is certainly a notable achievement. Kayin Barclay has built a storied scholastic player and has realized a dream. As a eight-year old, he was ambitious from the beginning. "I immediately thought that I would be good at chess. After I got my first rating which I think was 556. I told my mother that I had gotten 500 points from a tournament. I told her that grandmaster was 2500 and I should be a GM in about 5 tournaments. Unfortunately, that never happened." One interesting sign of ambition was Kayin's request to visit Russia, a long-time chess Mecca. His father Attorney Lester Barclay had promised him a trip anywhere in the world and he chose Russia. While he didn't meet any top Masters, he made an impression on the players in local parks. The trip no doubt had an effect on him and he certainly made an impression on the Russians… Russia and back. Youthful idealism was apparent, but young Kayin has come a long way from Chicago's Beasley Elementary where he picked up the moves in the 3rd grade. Having made an immediate effect on Kayin, he set modest goals for chess. After winning a Most Valuable Player award in 4th grade for the entire Chicago Public School system, he continued to march on… and on… and on. He credits Tom Fineberg and Tom Larsen with fueling his interest. 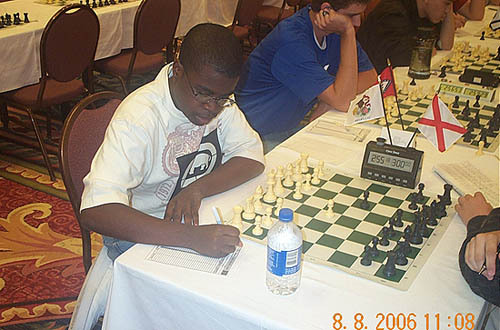 12-year old Kayin Barclay on "B" section's top board at 2003 Chicago Open. 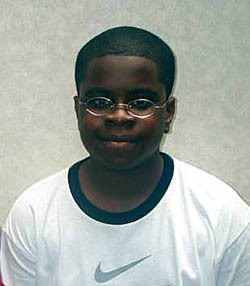 At age 12, he caused a stir after going 5-0 in the "B" section at the 2003 Chicago Open. He would then push his score to 6-0, but not without controversy. Controversy arose after his next opponent overslept and thus forfeited. Kayin went to report the forfeiture to the arbiter. As he gathered his set and clock, the forfeiting player bolted through the hall and while gasping for air, told the arbiter he thought the round started at 11:00. The round had started at 10:00am. Larry Cohen, the arbiter on the floor, asked Kayin whether he wanted to play the opponent despite his forfeiture. Without a second thought, Kayin agreed! After other players vigorously protested the ruling with Bill Goichberg, he told Cohen to make sure that Kayin understood that he was losing his forfeit point, but would have an hour advantage. Kayin stated that he understood the risks and won the game nicely. He then stood at 6-0. Unfortunately, he would lose his final game, but the impression had been made. Confidence, humility and strength all came to fore. A star was born. He would enroll in Whitney Young Magnet High School where he lead his team to city titles, a 2nd place state finish and an 8th place finish in the 2008 Nationals. He became a two-time Illinois High School champion and represented the state at the 2005 and 2006 Denker Tournament of High School Champions. His most memorable moment at Whitney Young was his first state title, a tournament where he scored a series of consecutive upsets. His win over Chris Nienart clinched the title. 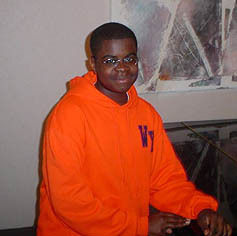 Kayin's rating soared over 2000 as a high school junior and he would repeat as the Illinois Denker representative in 2006. He would tie for first in 2008 with Ilan Meerovich, but generously decided to forgo any blitz tiebreaker allowing Meerovich to make his Denker debut. Two-time Illinois State Champ and top board for Whitney Young High School. The hallmark of future masters is to upset seasoned masters. 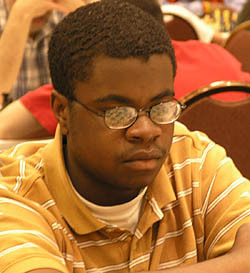 Kayin he scored his first Grandmaster scalp over Jaan Ehlvest at the 2006 Eastern Open. Barclay considers himself a aggressive positional player and prefers to play openings that have not been exhaustively analyzed. He has started several games with 1.e3 and one of his games began 1.e4 c5 2.Nh3. It is without surprise that Barclay admires players with original styles such as Magnus Carlsen, Alexander Morozevich, Veselin Topalov, and Hikaru Nakamura. He credits his improvement on Learn Chess from the Greats by Pete Tamburro and ChessBase's ABCs of Endgames CD. There is one other reason he has seen marked improvement in his play. "It seems that every time I get a good coach, I begin to do well. Right before I was 6-0 in the Chicago Open, I was working with Dmitry Gurevich and Anton Lohkov. Now I have gone back to Dmitry and have made tremendous strides," he stated. However, he offers practical advice to those seeking to make National Master. This requires a player in the United States Chess Federation (USCF) to accumulate 2200 rating points in tournament play. This feat is accomplished by only 1% of the nation's players and each person is awarded with a certificate from the federation. This summer Barclay shined in the World Open under-2200 section scoring 6/9 including a 19-move win over Damir Studen. playing Alaska's Nathan Saint. Photo by Daaim Shabazz. Currently, Kayin is awaiting the results from the 13th FIDE Invitational to find out if he has eclipsed the 2200 USCF rating barrier. This tournament perhaps represents his culmination, or as he describes it, peak performance. After reaching Master, Barclay's goal is to improve in 100-point intervals and earn the title of FIDE Master (requires a 2300 FIDE rating). "First of all, they must ask themselves if it is truly worth it. The time that I have invested in chess is probably equal to a college degree (in no way am I downplaying its worth). When I was intensively studying, I studied everyday about 5-6 hours. If you want to be a good player, you have to put in the time, learn how to study, and study the correct material. A coach is helpful but you have to go beyond what a coach does. Finally, I would say play as much as you can, there is no amount of studying that you can do that can help you react to that position that you have gotten in a random blitz game." Those who have met Kayin will soon be taken by his humble and soft-spoken demeanor. His work ethic and determination are characteristics that will carry him as far as he desires. There are many instances where Kayin has shown his generosity and it is fitting that he aspires to be a philanthropist. His parents Attorney Lester and Sue Barclay have a lot to be proud of and have done a fantastic job in raising him. Kayin will head off to Atlanta, Georgia where he will attend Morehouse College to study Business Administration with aspirations to be an entrepreneur and investment banker. He gets additional inspiration from world renown surgeon Benjamin Carson and the late publisher, John H. Johnson, of Ebony/Jet fame. If philanthropy is his goal, then certainly chess is a worthy cause he has already contributed to. 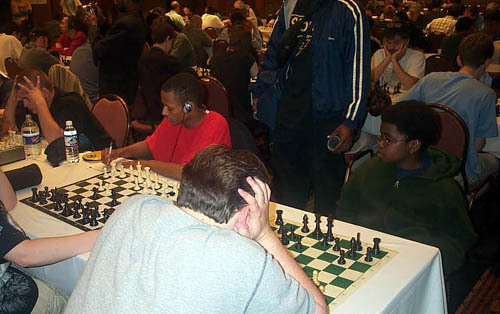 Kayin Barclay at 2007 Chicago Open. The Chess Drum, "Kayin Barclay joins Drum Majors,"
The Chess Drum, "Kayin Barclay at FIDE Invitational,"
The Chess Drum, "Kayin Barclay… Future Chess Master,"
uschess.org, "Barclay and Amanov take Park Forest,"
The Chess Drum, "Barclay joint first at Park Forest,"
Illinois Chess Coaches Association, "Results of the 2008 ICA Denker Qualifier,"
The Chess Drum, "Barclay featured in the Chicago Sun Times,"
The Chess Drum, "Barclay, Wamala star at Denker and Polgar Tournaments,"
The Chess Drum, "Kayin Barclay wins Illinois Denker again!" The Chess Drum, "Barclay wins 'Friendship Match' in a fierce battle!" The Chess Drum, "To Russia and Back: Barclay in Chicago Tribune,"
The Chess Drum, "Barclay battles Tate at Illinois Open,"
The Chess Drum, "Kayin Barclay 'Game of the Month' winner,"
The Chess Drum, "Kayin Barclay wins Illinois H.S. Championship!" The Chess Drum, "Players to Watch: Medina Parrilla and Kayin Barclay,"
The Chess Drum, "12-year old Kayin Barclay shines at the Chicago Open!"